This third-person shooter developed and published by Sega for the arcade includes 10 v 10 multiplayer matches played online. 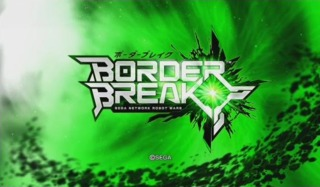 Border Break was first shown at the AOU Show in February 2009. Border Break is a 10 v 10, 3rd-person, class-based, arcade shooter game. The game is controlled through a mouse and analogue stick combination, with the mouse used for aiming and the analogue stick used for movement. This makes the game feel like a hybrid of shooter games on PC and console, with the accuracy of aiming the mouse offers and the fidelity of movement conveyed through the analogue stick. In addition, the cabinet features a touch-screen for manipulating the user interface, including choosing a class and picking a spawn location. Since this is a Japanese giant robot game, there is also a boost mechanic. The boost is activated is 2 different ways with the left hand using 2 buttons mounted on the analogue stick grip. A horizontal boost grants increased movement speed as though one were sprinting, while a vertical boost conveys a gain in height, as if to jump. The game feature a persistent character profile like Call of Duty 4 or Rainbow Six Vegas 2, as the player spent time playing the game, the player unlock robot parts, weapons, camo paints or cosmetic item to purchase. And these player stats are recorded on an IC card which must be bought and inserted into the cabinet prior to starting the game. However, the game does allow players to sign in as guests if desired, though they will be limited to the starting condition of only having the choice of the assault class with only 2 weapons unlocked: Sub Machine Gun and Grenade. The gameplay is a blend of the battlefield series and the overload game type of Quake 3: Team Arena. A tower structure named core is stationed inside each team's base, and players can reduce enemy core's health by killing enemies, capturing control points or attacking the core directly. A match ends when a team's core destroyed or the 600 seconds time limit is reached. Each team's player can choose between four classes: Assault, Heavy, Support, and Snipe, and player can customize their equipment, parts and painting during the intermission time before the player choose to start matchmaking.